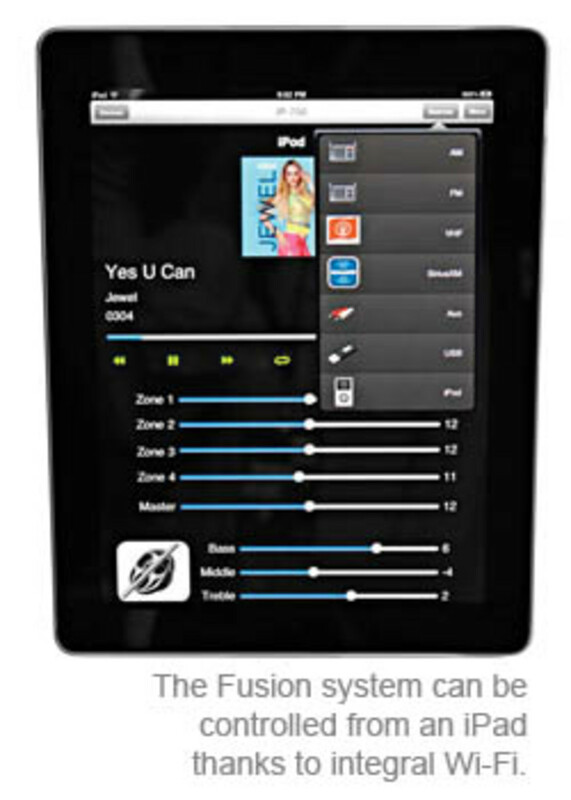 Fusion amps up the tunes with a marine stereo you can control from your ipad. Two things come together around Jim Akins: tunes and technology. 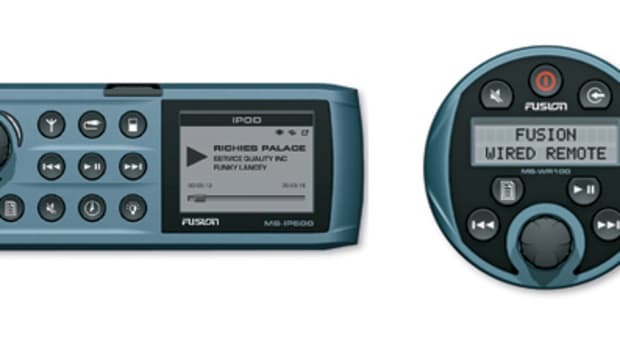 The 57-year-old Regal owner was an early adopter of the iPod, and it’s the technological halo of that Apple-brand item that led him to his boat’s stereo system. Akins’ Regal 35 Sport Coupe had a Fusion system as part of its original equipment, and he and his family use it more often than not. 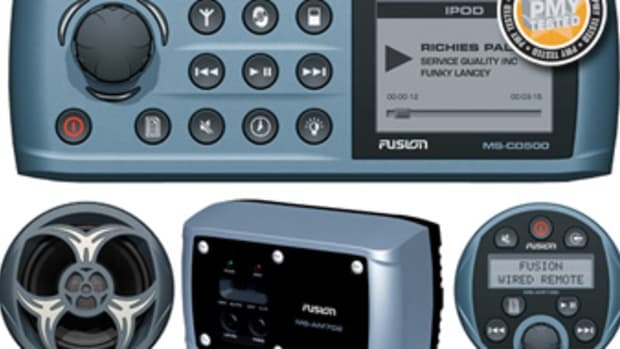 The Fusion MS-AV600 is a marine AM/FM/CD/DVD player with a Sirius Satellite Radio receiver, and on Akins’ boat it’s hooked up to two flatscreen TVs as well as six six-inch, two-way speakers. “It’s just so user-friendly, I can tell exactly which buttons I need to hit to get to where I want to,” Akins says. “I can hook up the iPod automatically—basically it just goes on—and it’s the same with putting in a movie.” He doesn’t want to fiddle with his stereo while he’s onboard with his friends, sons, and dog. Beyond the look of the unit, the biggest shifts in the 700 series are how much additional control it gives the user and how it connects to everything else. While Akins likes the zone control on his 600 series, Fusion added a zone to the new version—now it offers four separate control areas. The 700 series goes one better by letting the user customize the names of the zones within the system. “Most users want the cockpit and flying-bridge music to play about twice as loud as they want in the saloon—it’s just a function of bringing the audio to the outdoor space,” Crocker says. “We let you maintain that linear difference when you raise or lower the volume.” What he means by “linear” is that you can control the sound in all four areas and keep the proportion of loudness the same with the touch of a finger. The integrated control of the system won’t stop there thanks to Fusion-Link, a software platform that will allow the system to work seamlessly with a multifunction helm display. 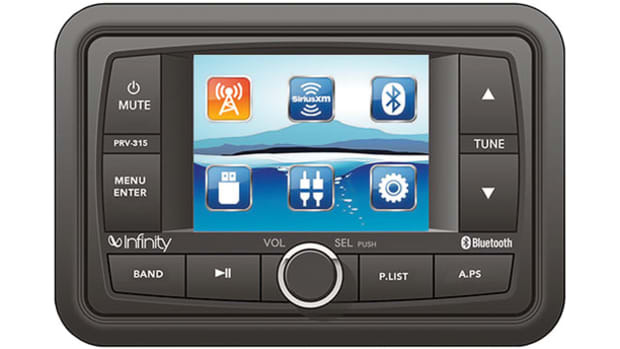 “The operator is going to be able to go to that multifunction device and take full control of the stereo and do anything he can do on the head unit,” Crocker says. As users of button-deprived smartphones and tablets will attest, touchscreen devices lend their intuitive functionality to sliding through album covers, selecting tracks, and shaping the music acoustically. 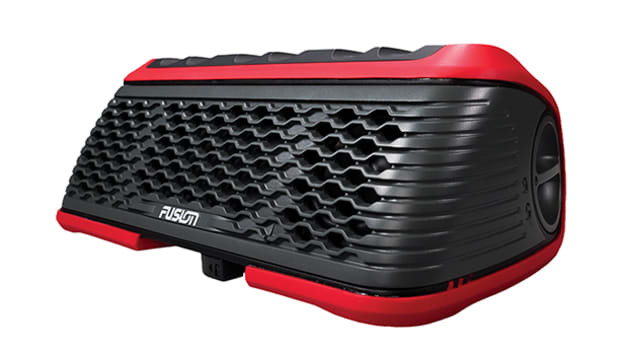 Fusion isn’t saying which marine-electronics manufacturers are developing helm devices to connect to the stereo, but development kits have been released to all of them, and he says three have signed on. 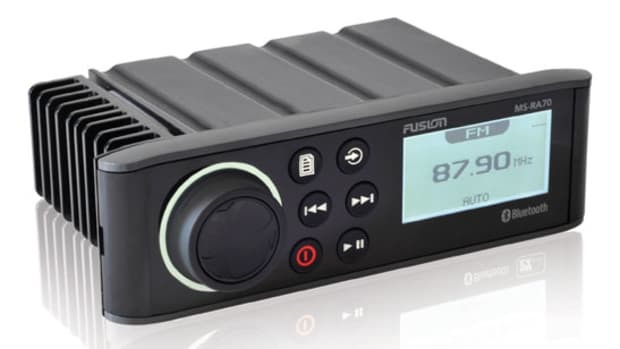 Fusion is also anticipating that its system will become part of a greater constellation of helm devices, so the 700 series is the first NMEA 2000-certified audio product, according to Crocker. “Our control head unit can link to an existing NMEA 2000 backbone, or you could actually begin the creation of a backbone, and we can then export data along the NMEA 2000 pipe to our remote control,” he explains. 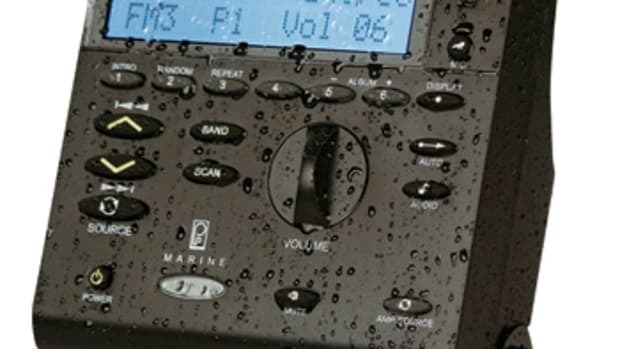 “So now our remote becomes an NMEA 2000 data repeater as well as a link to the head unit.” The user can set the Fusion remote to show any network data available on the boat’s helm system, from tank levels to anchor-dragging alarms. 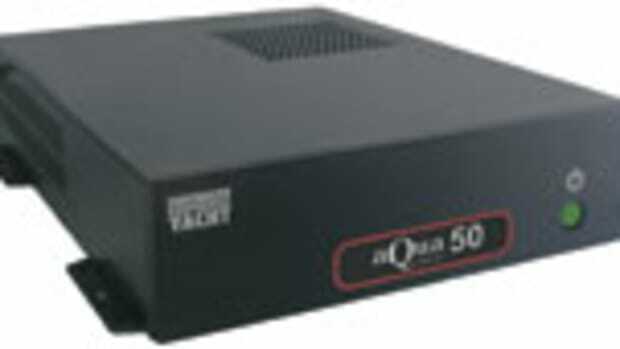 The Fusion 700 series needs to be plugged into a router. But system designers didn’t get ahead of themselves and try to deliver the Internet through the stereo system. Instead, that router will create a wireless local area network (LAN) on the boat that in conjunction with an app available for iPad, iPod Touch, iPhone, and Droid devices, turns touchscreen mobile devices into remote controls and lets any app user control the system from a device they already know how to work. It all sounds good to Jim Akins. 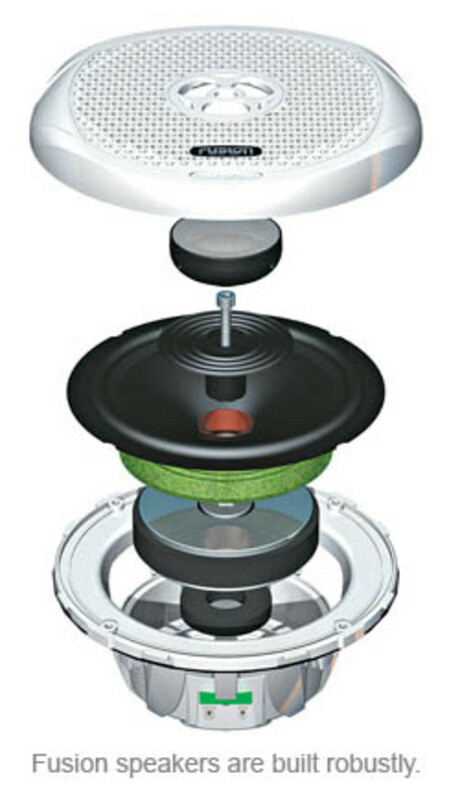 “My sons are into that bass sound—they probably would have wanted a subwoofer. 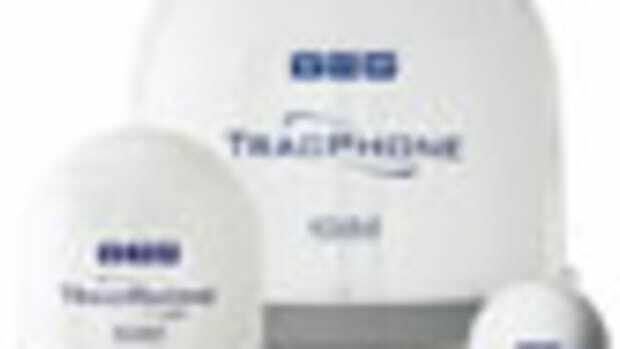 But we opted to use the money toward satellite radio instead,” he says. Maybe Akins’ next upgrade will bring that pounding beat. At least his dog won’t have to hear it. 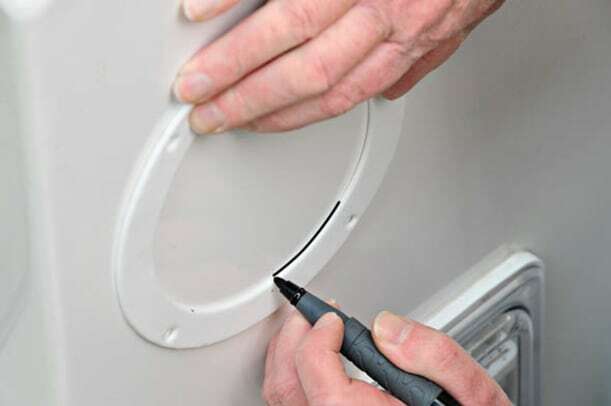 This article originally appeared in the April 2012 issue of Power & Motoryacht magazine.